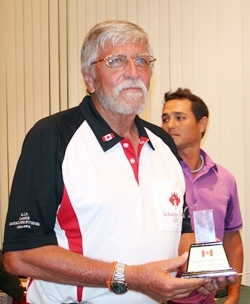 At the turn of the last millennium, a pair of local expat Canadians, Mark Gorda and Glen Dragland dreamed up the idea of holding a charity golf tournament with a Canadian theme in order to raise funds for their friends at the El Shaddai Home for Abandoned Children in Sri Racha. 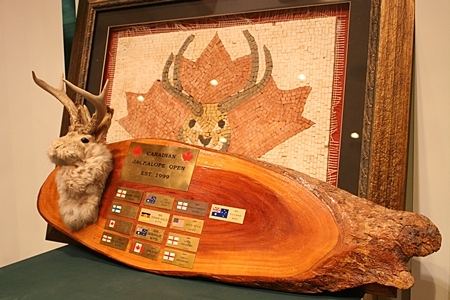 Thus was born the Jackalope Open (apparently they thought a moose too big to fit on a trophy) and the tournament would find an early spiritual home at The Hare House, with owner Stephen Beard offering his golfing knowledge and organizational skills to help the two Canucks get their ambitious undertaking off the ground. 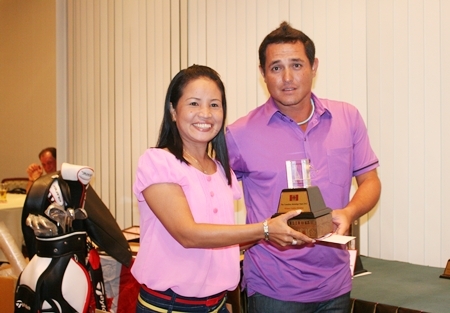 The tournament would see its first incarnation in 1998 (it wouldn’t be actually be called The Jackalope Open until one year later) and over 20,000 baht was raised for charity at the initial event. Since then it has grown and gone on to exceed all expectations and is now one of the major annual fund raisers for the Jesters Care for Kids Charity. So it was that after a week of rain in the Pattaya area, Friday August 3rd 2012 started with a slight, early morning shower and cloudy skies as 120 golfers made their way to the Khao Kheow Country Club for the 14th annual Jackalope Open – dedicated to good friend and founder of the Jackalope Glen “Lassie” Dragland, who sadly passed away earlier in the year. Registration opened at 10:30 and after checking in most of the players headed for their favorite spots – the Caesar table for the Canadian breakfast speciality and the 50-50 table for the much wanted raffle tickets. By 11:30 everyone headed out to the golf course ready for the shotgun start, and much anticipation hung in the air as individuals prepared their minds towards a good round; of course some of the golfers were thinking when they would see the first “refreshment” cart. At 12:00 the shotgun was fired and the golfers were off, a true test of golf on the slightly damp fairways. The field moved around A & B courses with not too many hold ups encountered and after just five hours the first groups arrived back at the club house. The golfers were treated to a splendid buffet provided by the Khao Kheow staff while they waited for their scorecard to be checked and tabulated. Mark Gorda – wearing his now world famous Jackalope Jacket kicked off with the technical prizes. 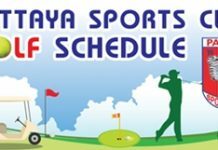 Near pins were won by the following: Hole A3 – Larry Immethun, Paul Erb, Andy Evans & Janthorn Kuanha; Hole A5 – Keith Taylor, Paul Daud & Gai Wilanan; Hole B3 – Larry Immethum, Moe Deverdenne, Chris Harkins & Herman Rowland Jr.; and Hole B8 – Thomas Reihsteiner, Gavin Wright, Bond Phillips & Herman Rowland Jr. Long drive awards meanwhile went to Egon Nielsen, Paul Ovens, Mark Holcomb and Tai Kanchana. 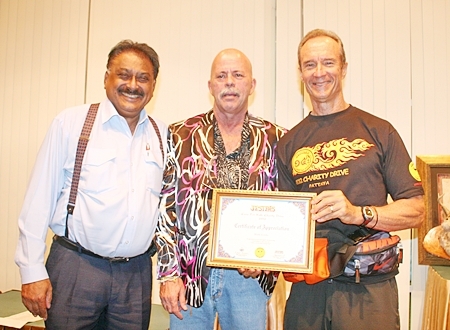 Tournament organizer Mark Gorda, center, receives a certificate of appreciation from Jesters Care For Kids representative Lewis “Woody” Underwood, right, while Peter Malhotra, MD of media sponsors Pattaya Mail Media stands left. The much anticipated 50-50 draw prizes were picked with the winner receiving half of the record setting total of 255,000 baht collected on the day thanks to the aggressive ticket selling by Derek, Woody & Bjarne and others who sold in excess of 4,500 raffle tickets. The winner Dave generously donated a sizeable amount of his half back into the charity fund. The Ladies division runner up was Oy Galbraith with 32 points. First place in the Ladies division was won by Janthorn Kuanha with 33 points. In the Rabbits division runner up was Alex Beviss with 35 points and winning the Rabbits division was Jim Simpkins with 44 points. Some unbelievable points scored in the Rabbits division again this year. First place in Division 3 went to John Gibson with 40 points ahead of Bernie Morris with 38 points and Bobbie Taylor with an even par 36. In the second division, John Helm’s 39 points just edged Neil Hunter into second by a single point and Moe Deverdenne took third a further point back on 37. 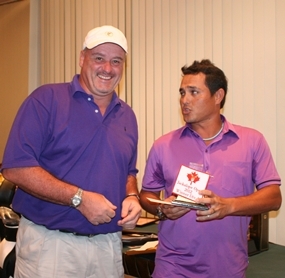 Division 1 winner Doug Lynch, left, receives his prize. The winner of Division 1 was Doug Lynch with a fine 40 points, while Bob Finley took second with 39 points after winning a count back over third placed Ty Kerr. Doug Lynch also took the low gross honours on the day with his round of 70 off the stick. 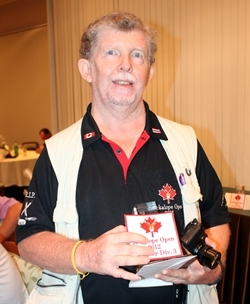 Now to the big one, and the 2012 Canadian Jackalope Champion was declared as Captain Damrong with a great 42 points. Unfortunately he was called away before being presented with the Jackalope Trophy, hence no photo of the main trophy being awarded. Captain Damrong’s team included Captain Steve Ponter, Kim Fletcher and Dan McLean. 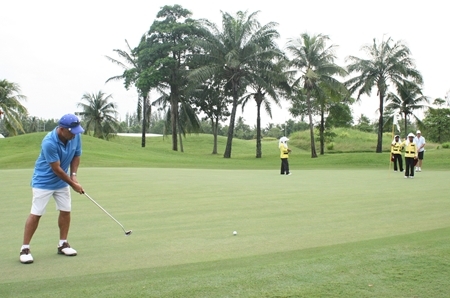 Mark Gorda and Mr. X, in their never ending quest to generate funds for the tournament, have pledged to donate 2,000 baht for every birdie and 10,000 baht for every eagle scored on the day. This year’s tournament recorded 45 birdies and 3 eagles. Ann & Dale Drader, Baltex Industries, Big Mango Properties, Bobby Taylor, Clayton Taylor, Jacob Taylor & Nam Muiller, Café Kronberg, Chris Harkins, Dan Buchinski, Derek Reaper, Glencore Industries, Jelly Belly Candy Factory, Jesters M.C., Just Burgers, Kelly Caron, Ken Cooke, Kennedy Consulting Thailand Ltd., Las Vegas Bar, Little Britain Merchants, Mark Gorda, Matt Millar, Mermaid Offshore Services, Michael O’Halloran, Mike Peeters, Moe Deverdenne, Neil Sandilands, Nova Group, Pattaya Mail, Pattaya Sports Club, Paul Erb, Ray Lepard, Rich Man Poor Man Guest House, Rich Wibrow, Rick & Todd Moran, Steve Mascari, Tahitian Queen, The Beaver Bar, The Golf Club – Brad Sproxton, The Haven – Stephen Beard, The Kerr Family (Jason, Mamo, Muffy & Ty), The Links – Russell Exley, The Palm Tree Restaurant & Bar – Glen Fiala, Todd Sherbaniuk, Vance Reesor, Wayne Ogonoski. We would also like to thank all the individuals who helped out at the registration and scoring, Eddie’s staff for the sandwich snacks, the Caesar table “All Star Mixers”, the 50-50 ticket sellers, Just Burgers and all the cart drivers who kept the golfers well stocked with their favorite “refreshments”. Special thanks also go to the staff at Rich Man Poor Man who on their own raised 47,120 baht. The Jackalope is not just about golf, it is also about giving back to the local community. On this 14th year of The Canadian Jackalope Open we will again be joining with the Jesters Care For Kids to help provide much needed assistance to the poor or disadvantaged children in the area. Division 2 winner John Helm. Division 3 winner John Gibson. Ladies winner Janthorn Kuanha receives her trophy. Celebrations on the green – another putt drops. Beautiful Khao Kheow was the setting for the 14th Jackalope Open.